Art Break Wednesday – and a Book Give-away! WELCOME to ART BREAK WEDNESDAY here on artsyletters! Grab your coffee or tea and visit each week to find creative inspiration, camaraderie, and special give-aways. As a writer/poet, I’m a sucker for the written word. My recent artistic adventures reflect that – whether in subject matter (books, etc.) 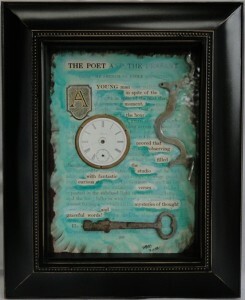 or in substance (vintage book pages, old typewriter parts and keys, and the like.). While my artwork is predominantly black and white, sometimes I like to color things up a bit. 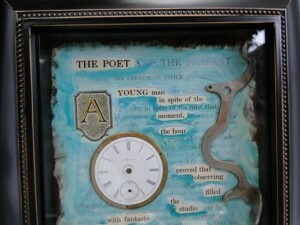 Here’s how I made the 5 X 7 collage I featured in my Poetry Friday post last week on my writer blog. First, I found a section of text from a vintage book that had “found poem” possibilities (double-checking online first to make sure it wasn’t the last rare copy of this edition or anything!). 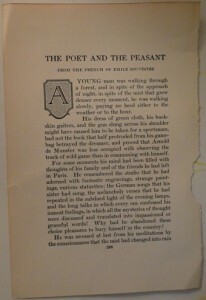 This is page 206 of the 1922 JOURNEYS THROUGH BOOKLAND (Vol. 6) compiled by Charles H. Sylvester. It’s the first page of a story called “The Poet and the Peasant” by French novelist Emile Souvestre. I added a little bling to that inviting initial “A” in the form of some 23-kt gold leaf. Then I played with the text on a photocopy to “find” my poem before working on the real page of text. I wanted to use the first part of the story title to call the poem, “The Poet.” I applied blue-green gouache washes (mixed with gel medium) to the page, leaving the words I wanted highlighted untouched. I added some darker washes underneath the words to make them pop. Then I sprayed workable fixative on the page. When dry, I applied acrylic gloss medium over all of it. Now for the fun part! I wandered over to my old metal cabinet (does anyone know what this was originally for? I snapped it up on a trip with my artist friends, Paula and Beth, at a local antiques market day). It’s full of recent treasures such as vintage objects and old metal pieces I’ve found on Etsy or picked up on the side of the road! It also holds small letterpress letters and antique type keys and such. I tried out a few elements to arrange on the page as a collage and settled on these. The beautiful old watch face, vintage key, and vintage Remington typewriter part were all Etsy finds. Another essential source of inspiration for me is enjoying the creative work of others – in museums, online, or in books and magazines. 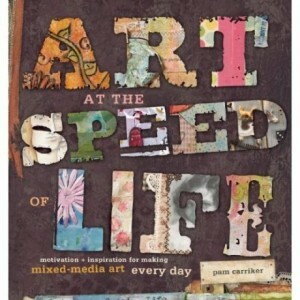 I’ve just read ART AT THE SPEED OF LIFE by Pam Carriker (Interweave Press, 2010). This mixed media artist and blogger offers up a feast for busy artists. You can savor a variety of artists and projects at a leisurely pace or grab your inspiration “to go” – the author offers “Speed of Life” versions of instructions for some of the featured works, perfect to fill an art journal in just a few days. Whatever pace you prefer, I’d love to send you this copy! Please leave a comment below about what inspires YOU, and you will be entered in my first book give-away. [Deadline for Entry is midnight EST Monday, Oct. 8.] One winner will be randomly selected, and then I’ll email you for your mailing address. Thanks for playing along! This entry was posted in Art Break Wednesday and tagged altered, Art at the Speed of Life, Art Break Wednesday, collage, Etsy, found poem, mixed media, Pam Carriker, vintage by artsyletters. Bookmark the permalink. Congrats on the new blog and the new enterprise, Robyn! The Jabberwocky bookmark looks fabulous (love that scary monster foot), and the raven and cauldron…yum! This post was fascinating. Although I do crafts and such, the fine arts sadly elude me, so painting and drawing are beyond me except for the rudiments. So that’s what inspires me – stuff I can’t do myself. In fact, I often write poems based on art because sometimes it just speaks to me and tells me stories. 🙂 And I’m always saving images of artwork to use as models to recreate, kind of like what this book is all about, I guess. Have been dormant from art for almost a year. Started painting/collaging tonight for the first time in FOREVER! Great serendipity to run into your post! Thanks! Collen, how wonderful that you’re creating again! Your comments absolutely make my day. Thanks so much for sharing, and all best wishes to you! I love reading how artists think! Thanks for letting us in on your processes, Robyn. I look forward to reading more. Hi, Diane! Thanks so much for visiting. You have quite the eye yourself with your beautiful haiga. I did all kinds of things like this and loved it. But you do it better, of course. Thanks so much, Rebecca! Your river of creativity is QUITE full, all the time, and no “small thing” goes unnoticed by you – so I appreciate the kind words! Your new blog is beautiful. WOw! Your photos are great and I love reading the process, it always helps my little brain to see what lurks behind the curtain. Inspiration comes to me from sites like this and books. I am reading Twyla Tharp’s Creative Way..inspiring and sort of a workbook. I also picked up Cheat Like an Artist and upon your recommendation Art and Fear. Once again, beautiful blog. Hey there, Beth! Thanks for popping in. Let me know how you like those books you’re reading – you always have the greatest recommendations. (You’ll like ART AND FEAR, I think.) I appreciate your support more than you know! Paula – Hearty Thanks, Friend. See? I put that old green cabinet to good use! ;0) Always glad to share the journey with you. P.S. Your mini Etsy store is lovely. The photography of your products is artsy and elegant too…go get ’em! There’s something about found art that’s so poignant to me…it’s like finding a rusty, engraved locket at a thrift store and wondering who wore it. What stories could it tell? Every piece in your art tells a story, and it calls to me. I WANT IT ALL!!!! 😉 …although I’m quite useless *with* art. Unless you count coloring. We’re all about stories, aren’t we Cathy? Thanks so much for ALL your support!!! Robyn! I’m so glad you are doing this. I’ll look forward to a dose of inspiration from you each Wednesday. Lots of little things inspire me. (Hence my problem with clutter.) I like the way you use “found” objects and repurpose them into beautiful pieces of art. It’s amazing how objects and words can transport us to another place and time, help us relive a special memory. I have to say that other artists like you are my favorite source of inspiration. (Another) great blog, Robyn, and I love your etsy items, too. Fun to discover another facet of your talent. I worked on collages this summer inspired by one of my (as-yet-unsold) picture book manuscripts. What a wonderful, freeing art form it is! Nancy – Hi there! I love the idea of making a collage inspired by a picture book. Thanks for sharing and for your kind comments, and good luck with that manuscript….! Good luck, Arlene! The book is a treasure for sure. Thanks for visiting. I am inspired by color and texture and how Light changes them both. I see art as soundless music. Texture and color is sometimes harmony, and Light can be volume. Then if you ask me about music, I’ll start talking about art. Life is inspiring. How gorgeous is your desciption, Geri – I’m glad I tossed out the question in this post just so I could read your comments! Lovely analogies, and they inspire me. i am truly inspired by lovely words and all the incredibly beautiful art of othe artists i am friends with on fb— amazing! I’m so thankful to Pam C. for sharing this link on her Facebook page – and to my wonderful artist friends as well. Thanks for coming over, Kelly! What inspires me predominently is nature… I am fascinated by the patterns and curves and angles that are found wherever you look. I also get huge inspiration by reading books by other artists, especially about their process. One sentance alone can serve as a launching pad for an entirely different exploration of my own work. Enjoyed your post immensely and look forward to visiting more of your blog. Thanks for the opportunity of winning Pam Carriker’s book – great writer and artist! Thank you, Shena, for such thoughtful comments! I respond to the same things – some turn of a twig or the curve of a feather, and certainly to books (like Pam’s) by and about art and artists. I’ll look forward to seeing you again and appreciate your stopping by! I love the look of these artworks, Robyn. I, too, am inspired by vintage things. My home is filled with family treasures, even though none are probably worth very much monetarily. I sleep in my grandparents’ walnut-colored bed; my grandfather’s dresser stands sentinel in one corner, and my grandmother’s sweet little dresser with three mirrors is on the room’s bay window side, where I can get the best morning light. Every room, has pieces that are memories. And I think these inspire me in how I live my life. How beautiful, Peggy. I felt like I was walking around in your house enjoying all those pieces with you. I love the histories, both personal and cultural, that vintage treasures hold (whether they’re worth much money-wise or not!). Thanks for sharing. Love your artwork, the metal cabinet, and your goodies. This is the kind of artwork I love to do! Isn’t it fun?! “atta’ girl”‘s. Framing a finished painting or drawing. Making enough money from my art to frame my work! A block of beeswax. A jar of powdered pigment. Scraps of fabric from Sew Memphis. A great root beer float. New paint brushes. The smell of Liquin. A pointy colored pencil. Traveling. Office supply stores. Lumber yards. Kneaded erasers. Craft stores. Bluegrass and pancakes in my kitchen. A blank sheet of hot pressed paper. Fabulous artwork!!! What a great list, Lisa! I love everything from “recovering addicts” to “lavender candles” to “my daughter’s drawings” to “bluegrass and pancakes in my kitchen… .” You obviously lead a full, appreciative, and creative life. Thanks so much for sharing!